It's BACK! 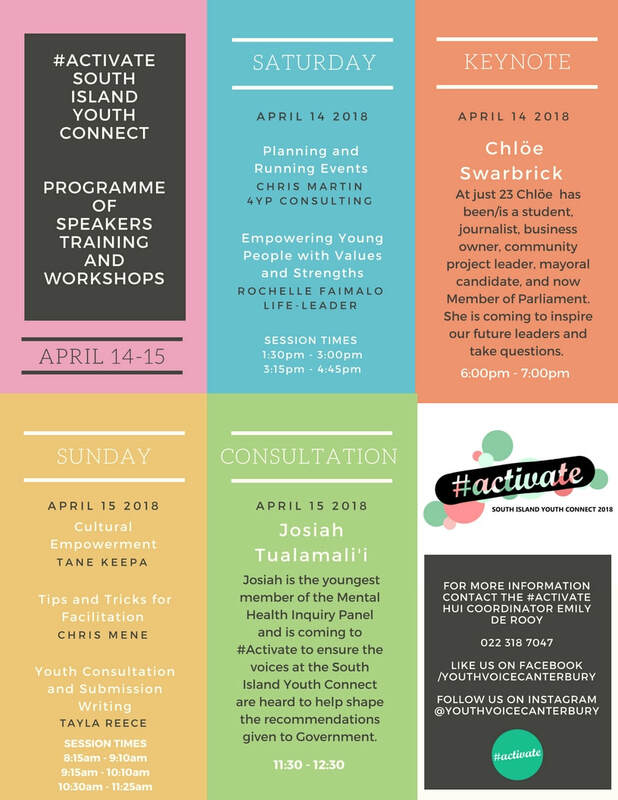 All the details you need for #Activate South Island Youth Connect below! Youth Voice Canterbury are excited to be bringing the South Island Youth Connect 2018 back for it's third year in a row! Over 100 young people from all over the South Island will be coming together for the biggest youth council training weekend of the year! ​The South Island Youth Connect allows groups to network, have fun and attend training and workshops that will benefit their year ahead. It is beneficial it is for groups to come together and have the time to connect, develop, be inspired, share ideas, and learn from other youth across the South Island. ​The South Island Youth Connect is for youth participation groups from around the South Island. Some training will be targeted at youth councils, however all youth participation groups are encouraged to register, including youth advisory groups, youth movements, youth boards, clubs, and youth-led organisations. Youth Voice Canterbury are excited to be bringing the South Island Youth Connect 2018 back for it's third year in a row! 100 young poeple from youth councils and youth participation groups from all over the South Island coming together to connect, network, take part in trainings, personal and professional development. We are charging a small amount to help cover the costs of accommodation for one night, meals for two days, a t-shirt, and resources. (please note - travel costs are at the expense of the participants). The cost per head is $35 including GST. Like last year, the South Island Youth Connect will be hosted at Blue Skies, 12 Williams Street, Kaiapoi. The event will be mostly located at the Youth Lodge, more information about Blue Skies can be found here. Accommodation for Saturday 14 April and meals are included in the registration costs. However, we also have the facility booked for Friday 13 April for any group interested in coming to the venue early. If you are intending on arriving the night before, please contact Hui Coordinator Emily de Rooy to arrange accommodation at Blue Skies. You will be charged a small fee per person which will also include dinner on the Friday night and breakfast on Saturday morning. We also have a Facebook Group that has been running since the very first #ACTIVATE in 2016! CLICK HERE to join and invite the other members of your group who are keen to attend! It's a great way to get updates and connect with other youth participation groups from around the South Island. Beginning her second year on the Youth Voice Canterbury Management Team Emily 19 years old and studying a Bachelor of Commerce at the University of Canterbury majoring in Human Resource Management and minoring in Human Services. She's also coordinating this years South Island Youth Connect as part of an internship paper at UC! We're excited to have her on board and if you have any questions or want to get in touch she's happy to have a chat! Still not sure what this whole South Island Youth Connect business is all about? Check out this video below to see all the happenings from #ACTIVATE 2017!